If you're looking for a shopping bargain, think about swinging by JP's Boomerangs for the thrift store's parking lot sale this weekend. For the North Shore-inclined, the Kerouac Literary Festival continues in Lowell today and tomorrow. I also noticed a chili cookoff (Noon to 3pm) at The Grog's in Newburyport ($10). Isn't harvest season a good time for some locavore love? Celebrating our regional yumminess will be a bunch of exhibits, demonstrations, and activities as well as farmers and chefs to talk to. There is a list of participating restaurants, shops, etc; although I think its more about having some tasty bites and appreciating food made in New England. Most food dishes should be $5 or less. Other people were a bit disgusted when I told them, but I think it's rather interesting to see an expert butchering of a whole hog (11:15pm), lamb (2:30pm), or goat (3:30pm). Local beer tastings will be at the Daily Catch on Northern Avenue -- 10 tastes for $10 -- it's going to be busy because the advance tix are sold out. Of all the crazy studies that are conducted every year there are some that are so ridiculously good that they should be recognized even if the Nobel committee doesn't have time for them. In 5-minute lectures the winners will describe their research in such topics as collecting whale snot with a a remote-control helicopter, preventing winter slips by wearing socks outside of shoes, swearing can relieve pain, and companies would become more efficient if they promoted people at random. Some previous winners will also speak about necrophiliac ducks, bras that turn into gas masks, and more. Science and humor rarely coincide much better than this weekend. Since I tried to go to this food fair, a Burmese restaurant has opened in Allston, but these dishes will be homemade treats that should range between $5 to $8. Some mistakes I made that you can avoid: Don't go too early, and don't go into the main church room on the ground floor. Don't let the Burmese women who're ignoring you stop you from asking to get something. Take a chance on an arty variety show that should include excerpts of plays-in-progress, a musical-in-progress, film, a bit of commedia dell'arte, song, dance, a short story, and poetry. They start with brief tango lesson for the first 15 minutes or so, then you can try for as long as you like until the tango stymies you and dancing and sway in your own style. It doesn't hurt to get a basic idea of the correct steps, but no one criticizes your dancing. Bring a partner or find one there -- I've done it both ways and enjoyed myself. I've thought it's even a pleasant sight if you want to sit back and soak it in. I'm not the only one who thinks a night of rockabilly, honky-tonk, and jump-blues would be a good time -- there should be a whole bunch of tattooed rockabilly cats and dames in attendance. I guess my virtual buddy Easy Ed has got some juice, because this is a reunion gig for both Johnny Carlevale & His Band of All-Stars and Nate Gibson & the Gashouse Gang. The live music kicks into gear after some dance lessons with the rippin' rockabilly of Gunsmoke from Ontario, Canada. 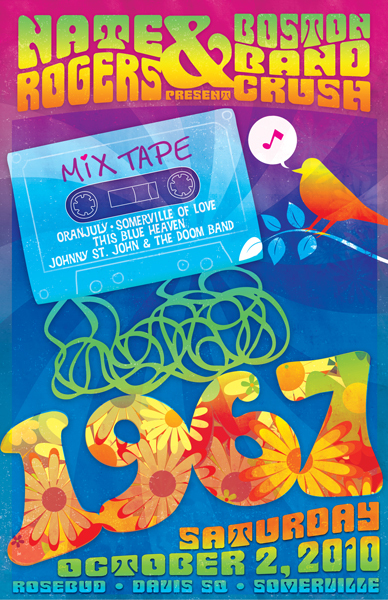 When two bands with sterling pop-rock sounds get together with two bands assembled by the fantastic John Powhida and Ad Frank for a musical salute to 1967, it will be hard to be something less than awesome. Expect to hear tunes from great bands like: Beatles, Stones, Kinks, Who, Doors, Jefferson Airplane, Velvet Underground, Aretha Franklin, Cream, Jimi Hendrix, The Beach Boys, etc. I've read there will be psychedelic lighting to transport everyone back to the Summer of Love. Feast Of Flesh X w/ "Night Of The Creeps"
After waiting in line, getting your free gory goodie bag, watching the horror burlesque and the best zombie contest, listening to the stoney, space-rock from the aliens and robots of Planetoid, you will be sufficiently entertained for the campy '80s alien/zombie flick. It does have a some good lines (and I think there were a couple of tense moments). The Feast of Flesh is the beginning of the Halloween season for me. Anyone can wait until the end of the month, but these guys have been getting worked up all week with the "Terrorthon". Mr. J. Cannibal will host you through a creepy good time.